Christmas is fast approaching, isn’t it? 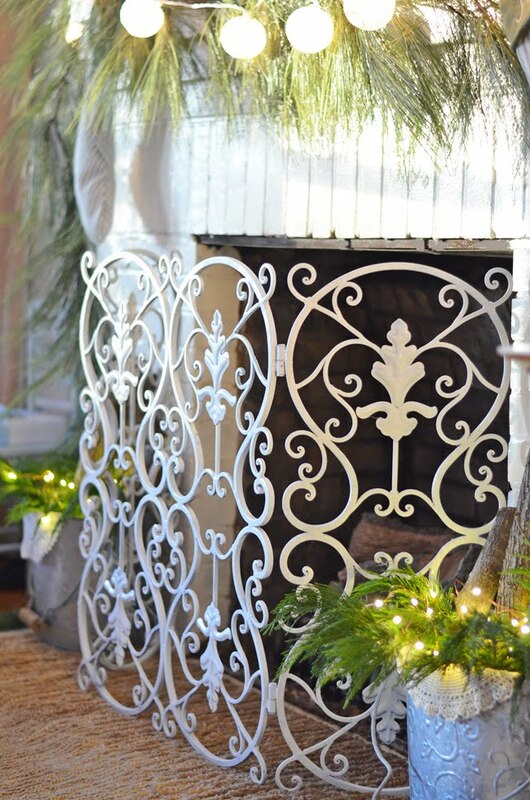 Today I’m sharing our Angelic Christmas Mantel with you. Usually I start decorating the mantel first each year, but this year, I started with the front porch. But I already knew that I would be using an angel theme for the mantel this year. In fact, the angels have been sitting on our mantel for several months now! Isn’t she beautiful? She is holding a lighted globe, and I’m so lucky to have a pair of them! This all came about because my sisters-in-law and I were working on decorating some tables for our church fundraiser which had the theme “Angels Among Us.” We knew that we wanted one of our tables to have an angel theme and we were out shopping one day and ran across 2 angels. We purchased one to use as a centerpiece for our table, but one of my SILs surprised me with the other angel as a birthday gift. 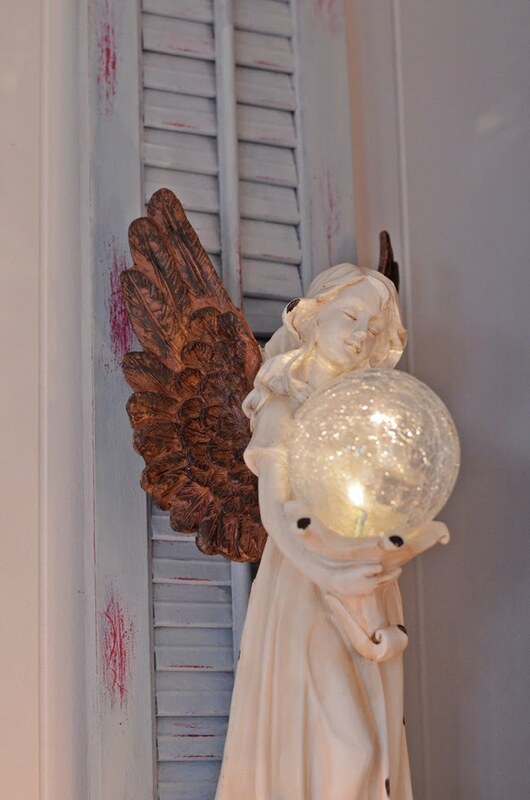 The angels are made of resin and intended for outdoor use in a garden. They have a solar powered light that turns on at dusk, but I cannot imagine putting something so beautiful outdoors in the garden! Look at the beautifully carved animals at the base of one of them! It took a while to figure out how to make the solar light come on during the daytime. All you have to do is cover the light sensor on the back to make it “dark!” (Thanks for that tip, Jim!) 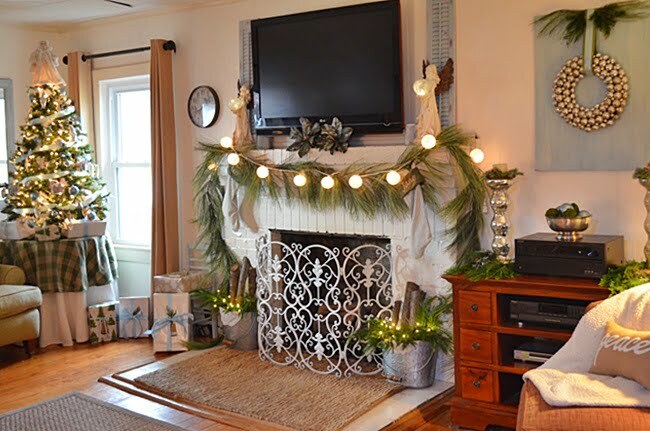 You may notice that the red shutters that I’ve used in decorating a previous Christmas mantel are now blue! 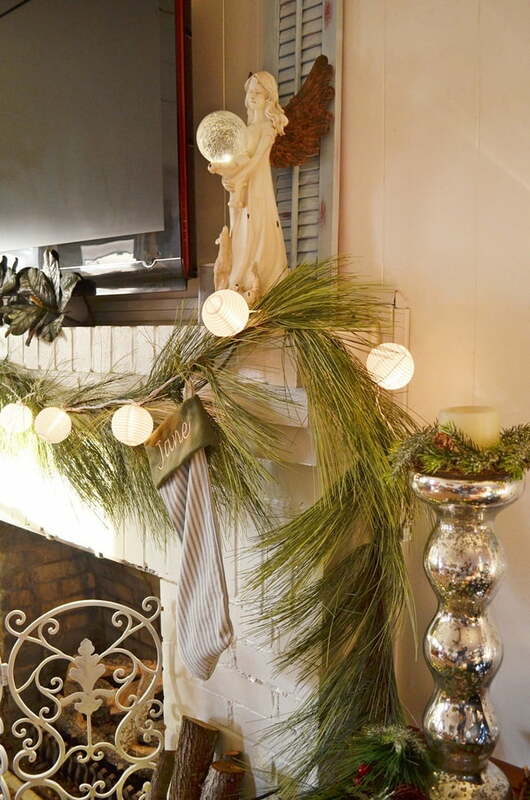 The whispy pine garland that I used on last year’s Christmas mantel is back again this year. I decided to repeat the round shape of the angel’s globes with the string of lights on the garland. They are actually (affiliate link) small, paper Chinese lanterns that I ordered from Amazon. I just love their warm glow! 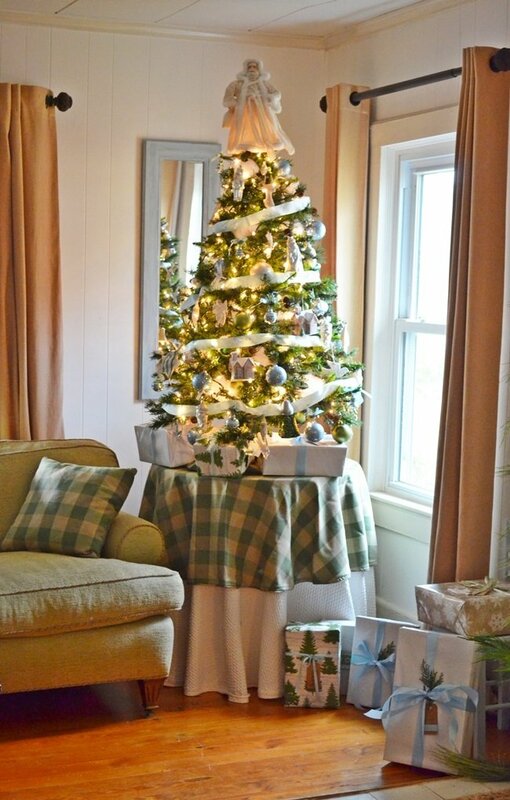 But I’ll have to admit that I really didn’t think about how the white cord would look on top of the pine garland! If I had more time, I would take the lights off and paint the cord green with some craft paint. But as I said, Christmas is fast approaching and I’m hoping no one notices but ME! Remember that sewing machine I was telling you about? I put it to work again by stitching up these blue and white ticking stockings. (Need to practice my stocking making skills!) The ticking was vintage since I used the fabric from an old, old pillowcase to make the stockings. The monogrammed cuff was taken from last year’s stockings. You may notice something else that’s been painted. 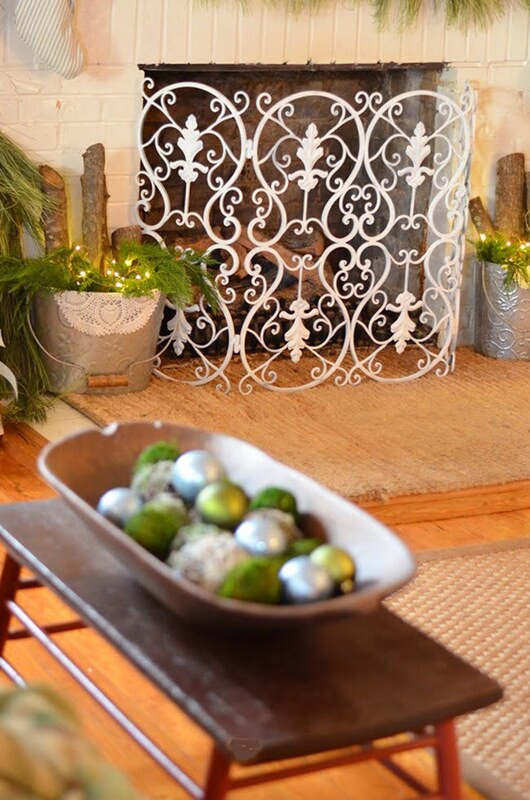 Yes, I finally painted the fireplace screen, and I’m so glad I did because it really stands out now. Because it was dark before, it just faded into the fireplace opening. I’ve had people ask me where we got the screen. We bought it years ago in a home decor store in Mt. Pleasant, SC. 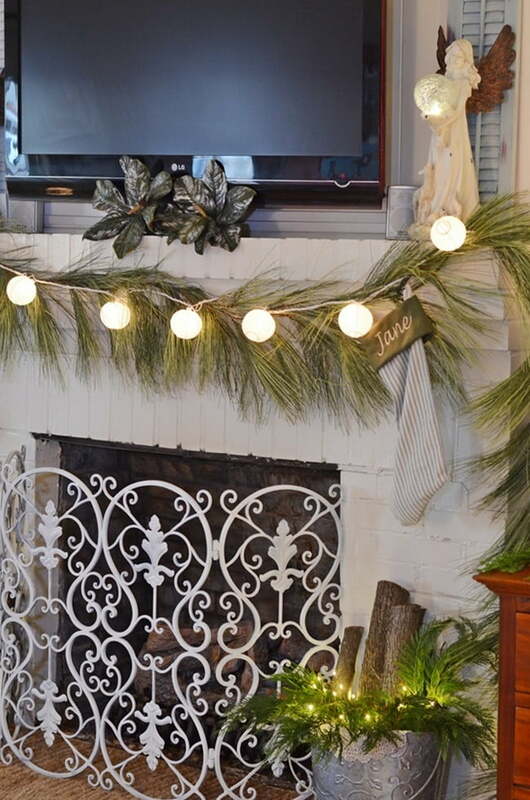 Here is a similar (affiliate link) fireplace screen that I found on Amazon. Update: Here is a link to the exact same screen on eBay, but we didn’t pay anywhere near the amount for ours as they are asking for this one! On each side of the fireplace are some metal buckets that I put some of those logs that Leo cut up from the tree that fell during the hurricane. 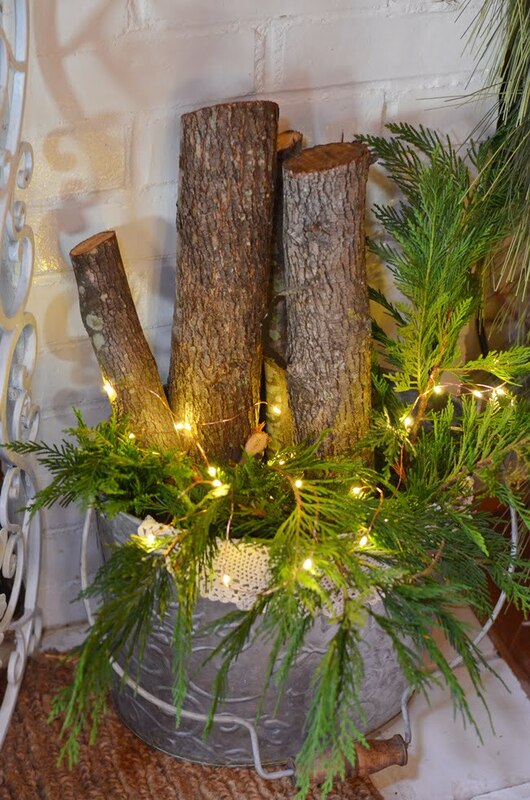 Fairy lights tucked into some Leyland cypress greenery look especially festive. Here you can see the whole Christmas mantel along with the tree and some other decorations near it. As you can see, I have a blue, green, and silver theme going on. 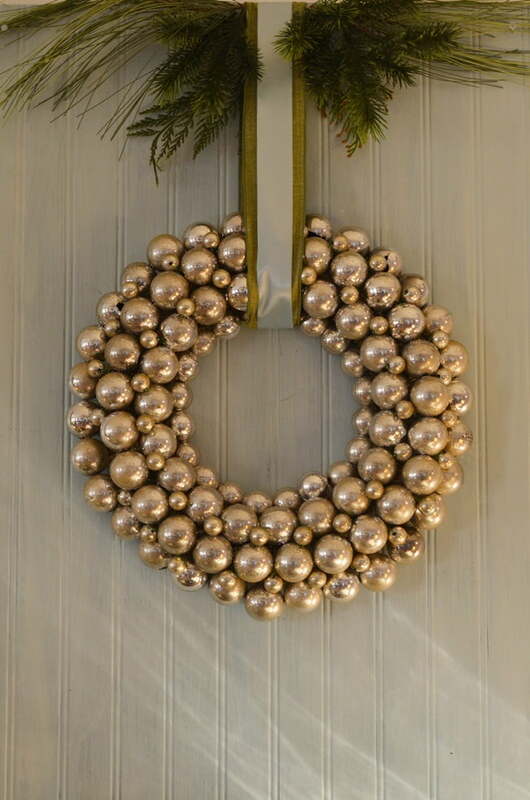 I painted this piece of beadboard the same shade as the shutters and hung this ornament wreath that I’ve had for many years on it. I’ve never really decorated with blue but I’m giving it a trial run in our living room. So far, I’m really liking it mixed in with the green. 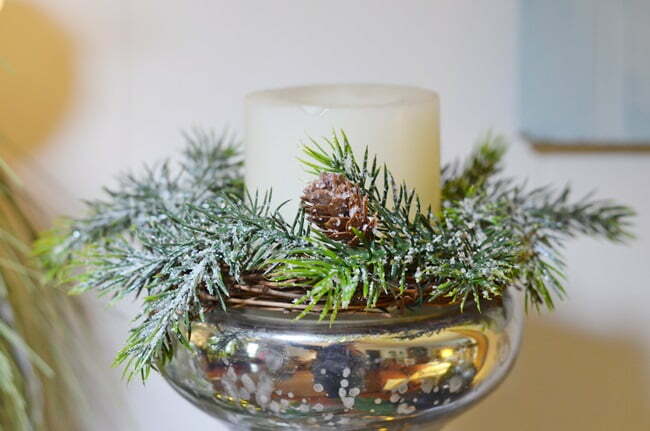 The mercury glass candlesticks nearby got adorned with some greenery and candles. 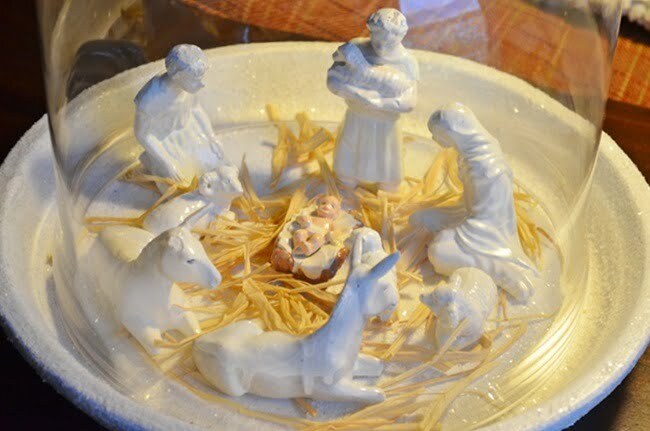 There’s a mix of blue and green ornaments in the old dough bowl. On the tree you see our white Santa tree topper that is special to Leo and me. We found it the year that we did our first tree together. Blue satin ribbon serves as a garland. Here are a few of the white Santa ornaments that I’ve collected over the years. 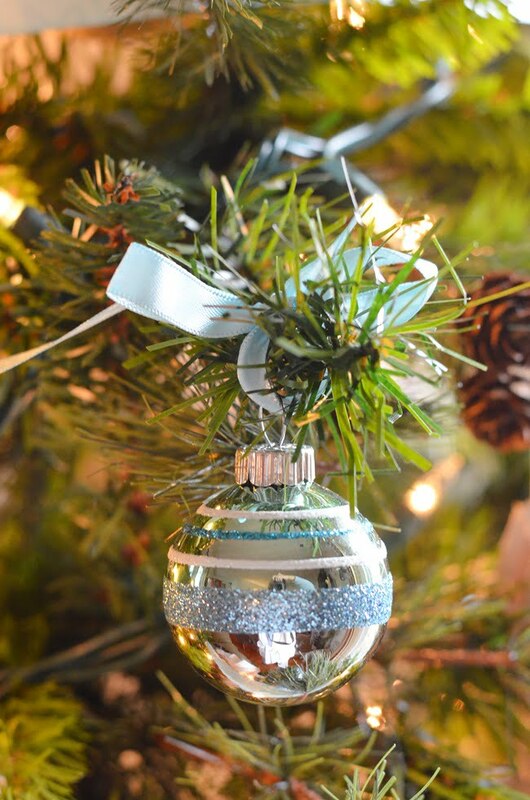 Imagine my surprise when I came upon these reproduction Shiny Brite blue and green ornaments at TJ Maxx! Just couldn’t resist! And the gift wrap coordinates with the blue and green theme, too! Another view of the tree with its mix of old and new ornaments. 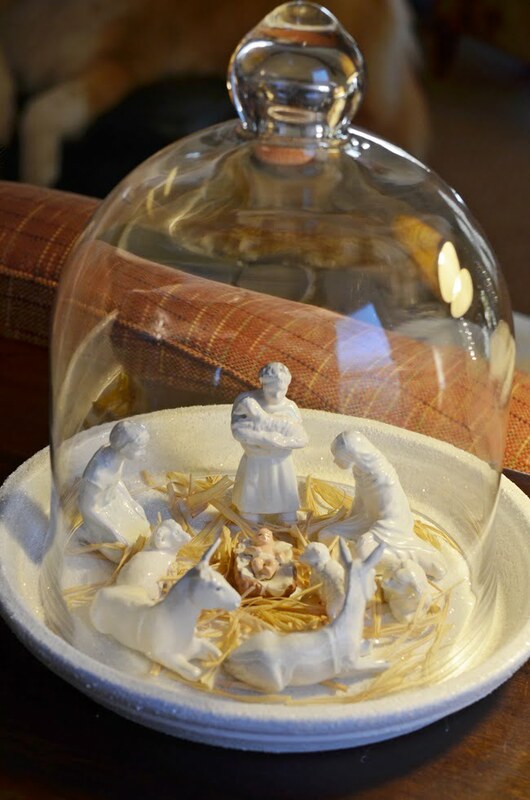 Nearby is a nativity scene under a cloche. I found the set at an auction and spray painted it white. Somehow I couldn’t bring myself to spray paint Baby Jesus! Seemed a little sacrilegious, you know! I hope you’ve enjoyed seeing this year’s Christmas mantel and our tree. 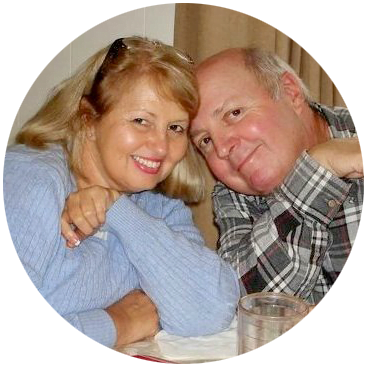 Just remember, there are angels among us, often disguised as our friends, giving us hope and comfort. 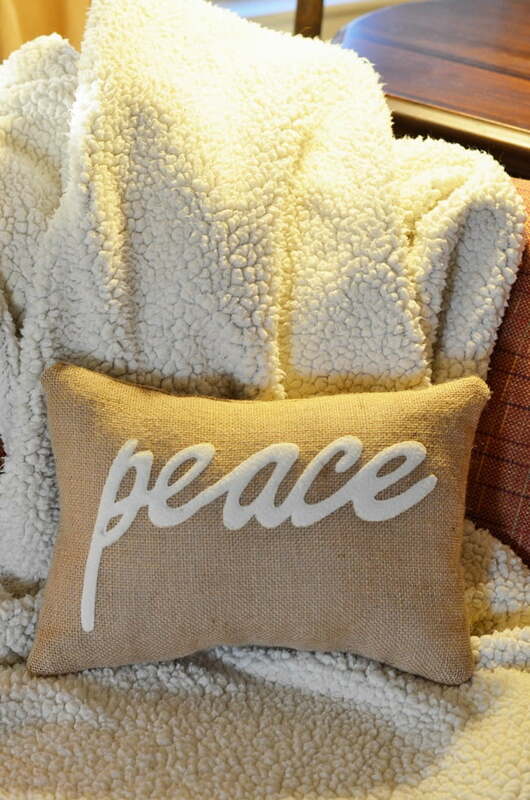 May the angels watch over your family and bring you peace during this beautiful holiday season! I just found your blog thru another one I follow. It is beautiful. I am looking forward to your posts. Everything is so beautiful, Jane. I love the greenery, and your choice of colors looks so pretty. I have an angel collection, I need to display for a while. Maybe I’ll do that after Christmas. Hope your holidays are happy! Your mantle looks wonderful. 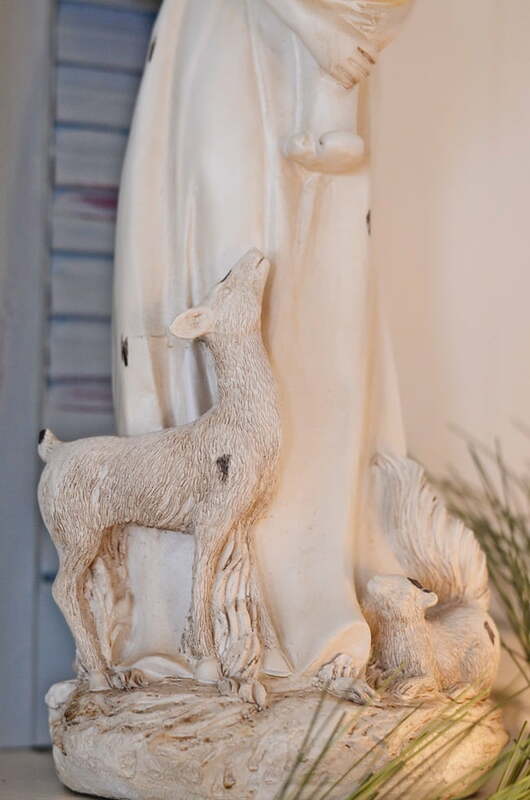 I love the Angels, such a great piece on the mantle even if it’s for meant for outside. I love that you brought it in. I love your Christmas tree and you’re right, Angels are around us:). 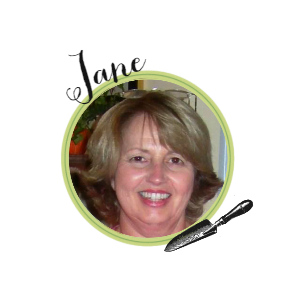 I love your angels Jane…and all the greenery is so pretty. I hope you and Leo have a lovely Christmas…you have been such a good friend to me and I treasure that. Happy Holidays! Jane your mantel is heavenly and beautiful. Love your sweet angels. Everything looks so cozy and pretty for Christmas. 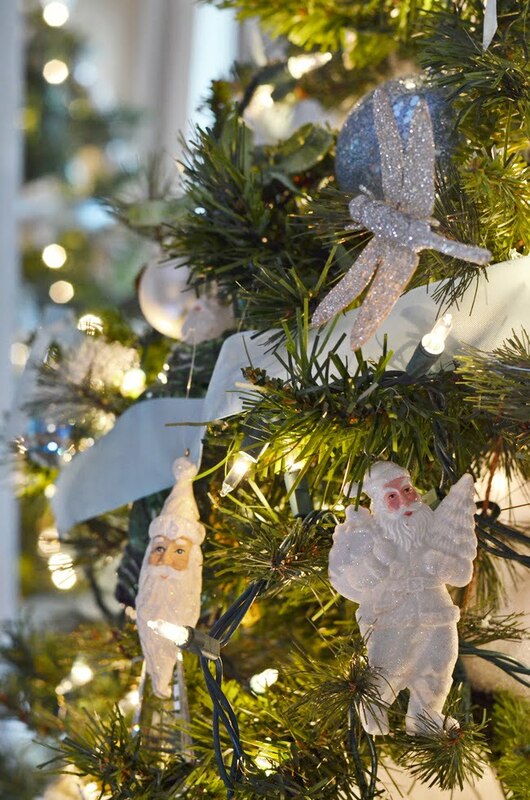 The Christmas tree is lovely and I absolutely love the angels on the mantel. Everything looks beautiful. Your room is absolutely stunning! 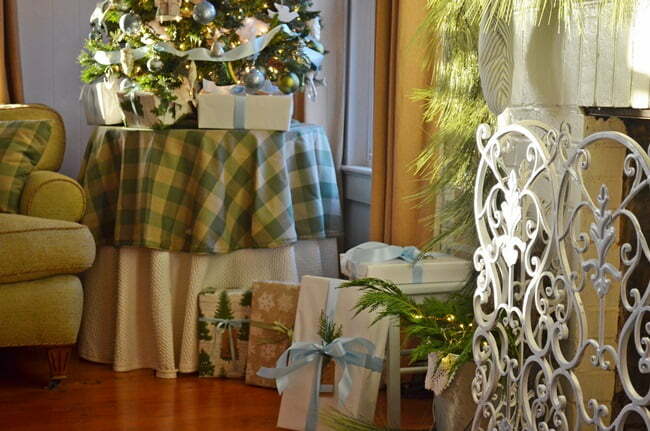 The white, green and blue is such a pretty combination and so festive. 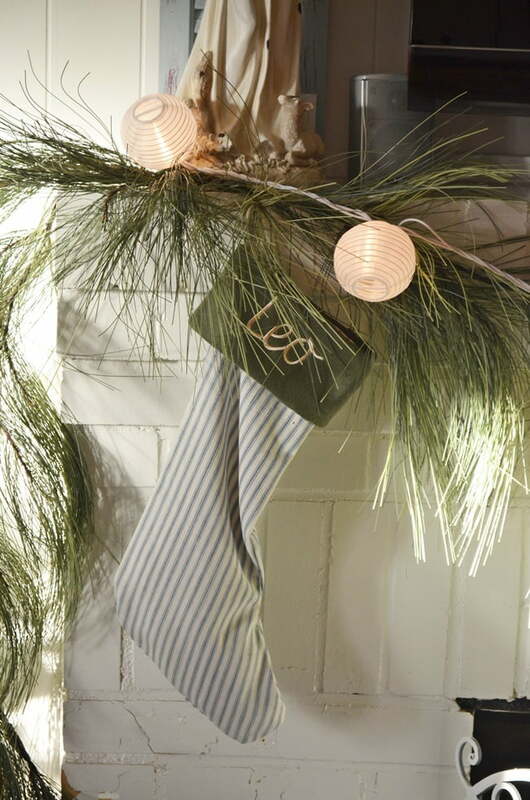 I have always loved pine roping for garland it adds so much to your mantel. I got my first fairy lights this year and love the sweetness they add. Every detail of your room is very pretty and festive. 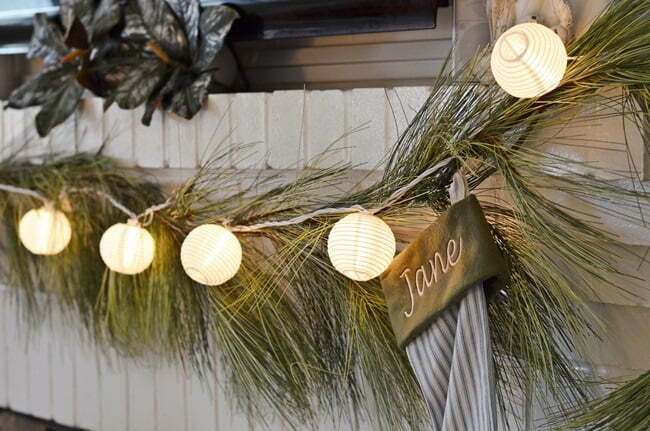 Pretty Jane and I love the Japanese lanterns for the mantel. So unique! 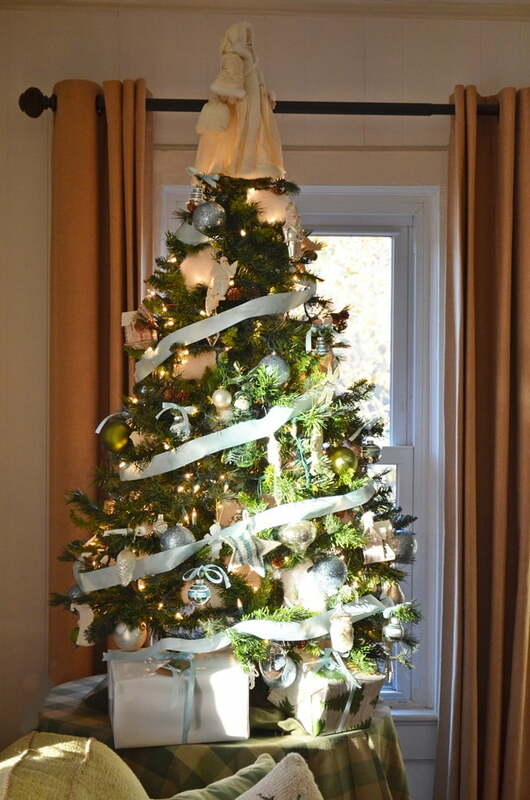 You are so creative in your decorating.I love your Xmas mantel , your tree,well everything you have shown . Painting the navity scene would never have thought of it..but ever so cool.Yes sacreligious to paint Jesus. LOL! Always love you themed holiday pictures. 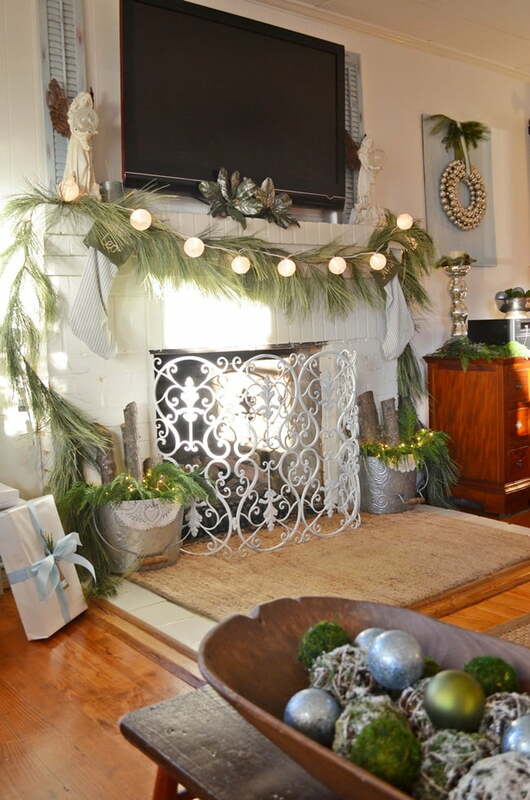 Love the mantel and all of the Christmas decorations. Have a very Merry Christmas!! ??? ?